What do you do when you find yourself in Palma, the capital of Mallorca, with 3 hours to spare? You explore the beautiful streets and give yourself neck ache from looking up at all the stunning architecture. Don’t have long in Palma? Here are some must-sees when you only have Three Hours in Palma. We spent the week in the East of Mallorca in Cala D’or, but it was only an hour from Palma, so it seemed a shame to not visit. 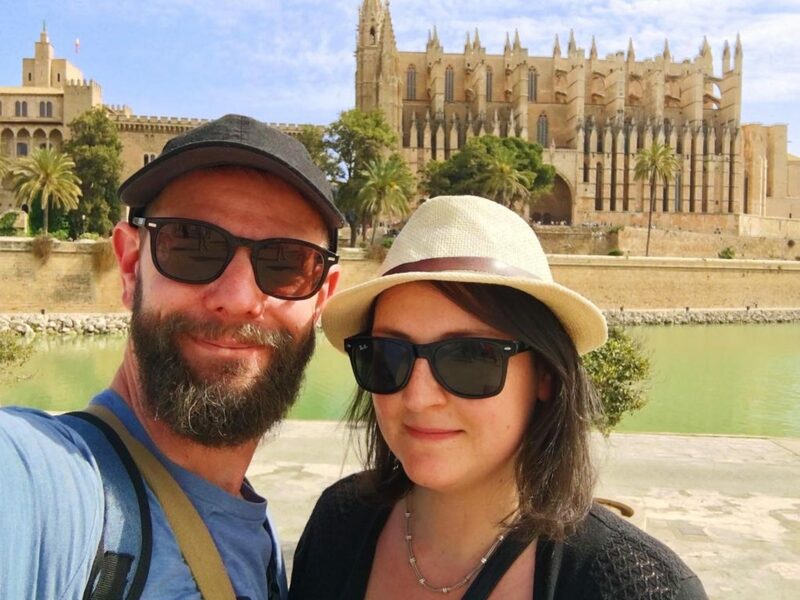 Dave and I have both spent a fair bit of time in Palma on other trips, so we didn’t want to spend the whole day there. Especially with a toddler that was just learning to walk. So, we tied it in with a trip to Valldemossa (more on that in another post) and stopped off in Palma for a few hours on the way. 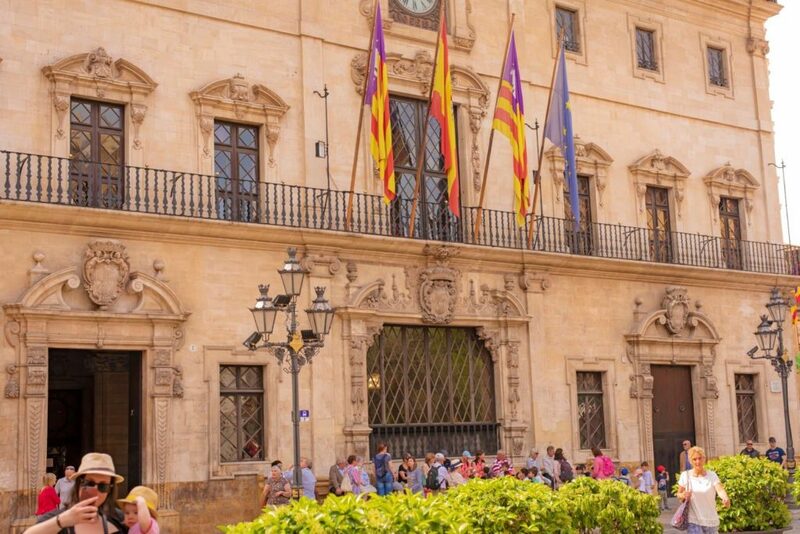 When you enter the city from any of the main resorts, you are most likely to come along the costal road and one of the first things you will see is the dominating Palma Cathedral. Constructution began on The Cathedral of Santa Maria of Palma, which is its full name, in 1229 and work completed in 1601. It’s a Gothic Roman Catholic Cathedral and being 121 metres long, 55 metres wide and 44 metres tall it is pretty hard to miss, and you wouldn’t want to either. If you have a little bit extra time in Palma, I would really recommend paying to go inside – it’s incredible. Not just architecturally stunning, but a really nice spot to spend a relaxing 30 minutes to beat the heat. Tree lined garden areas and the fountain at the front of the cathedral are all good spots for people watching or to re-apply sun cream. There are street performers everywhere, or people dressed up that you can have your photo taken with, and little pop-up markets to buy locally crafted gifts. If you don’t have a lot of time in Palma, then a walk round the outside of the Cathedral is a bare minimum must. It is bustling with tourists, even out of peak season, so be aware of your surroundings as it’s a popular pick-pocket spot. Avery loved toddling round and I think she was a bit in awe of the sheer size of it. If you head away from the water and the Cathedral and through the narrow streets you will find yourself around Ajuntament de Palma, which are the city council buildings. Don’t they look so much nicer than the 1970’s council buildings you usually find in most UK towns? To be fair, Manchester town hall is pretty incredible. 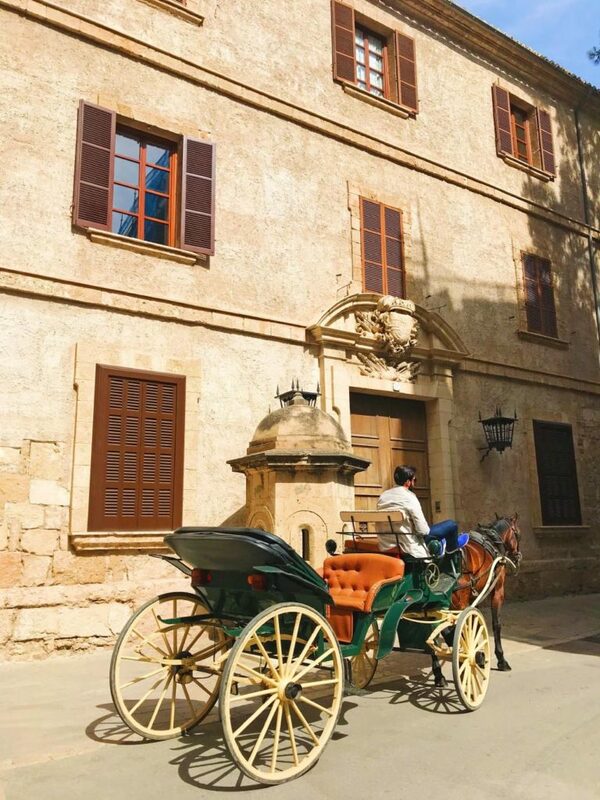 Built in 1680, Ajuntament de Palma has a traditional Mallorcan feel to it. Right in front of the building is Square of Cort, which gets its name due to being the gathering place of old courts, and it’s another great spot for people watching or getting a few family selfies when the toddler will let you pick her up for 2 seconds. All the new sights and smells, you can’t blame her for wanting to run off! 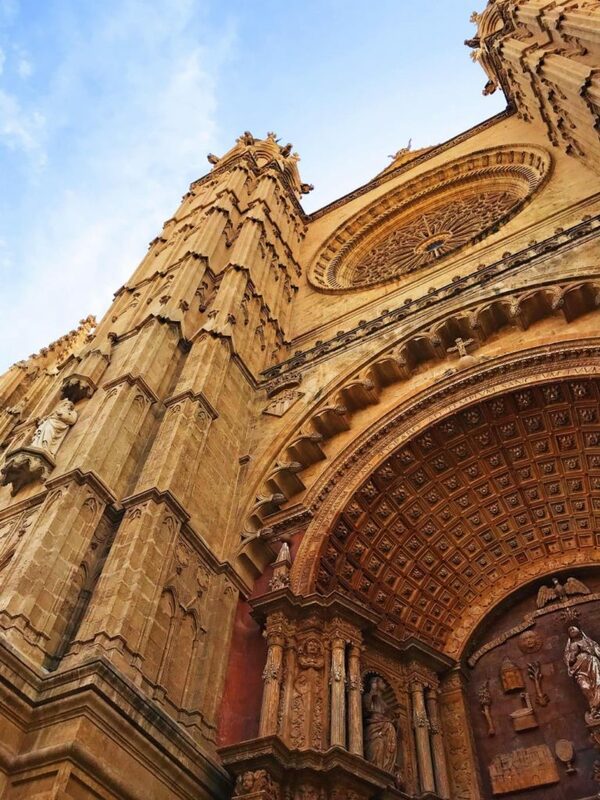 Whilst the Cathedral is the main church in Palma, and the biggest draw for tourists, Parròquia de Santa Eulàlia is also worth a visit and you will most likely go past it whilst wandering around the city. The church of Santa Eulàlia is one of the four oldest churches in Palma. Named after the patron saint of Barcelona, it was built at the end of the 13th Century. However, the main façade and the bell tower were rebuilt in the neo-Gothic style between 1894 and 1903 after the earthquake that had hit Majorca in 1851, which is why it looks so different from the side walls. This funky Gaudi-esque building is a photo opportunity for most tourists passing it in Palma, but it’s actually a dental surgery. I think I would look forward to visiting the dentist a little bit more if I got to go to this building! Imagine sitting there having a tooth out and seeing a load of tourists taking photos. Dentist or not, it’s an awesome building and right in the middle of the shopping district of Palma which has just about every brand you can think of. If you need a little shady spot to beat the heat and have a little picnic, then head to La Rambla. It has been built on top of the old riverbed of La Riera and is a great place to check out the flower stalls and sit outside a cafe. The streets just off La Rambla are also where you will find all the designer shops, so it’s another good place to people watch and see how the other half live! As always, remember to look upwards, as the top half of the buildings are incredible. At street level they might just look like big doors, but look up and you will see so much more. It doesn’t quite have the same vibe as it’s namesake in Barcelona, but worth a stop for 10 minutes. The highlight for us when visiting any old city is the narrow winding streets, the buildings that are just bursting with local life and the vibrant cafes. Tourists are going to be everywhere, but step a few streets back and you will be immersed into real city life. We couldn’t walk 10ft without a local stopping to chat to Avery. I think it was the hat, or the fact that she looked like a pink marshmallow (this was a change of clothes due to an “incident” on the journey there), or that she was just stomping around the streets, waving and saying “Hiya” at people. I swear she once said Hola! 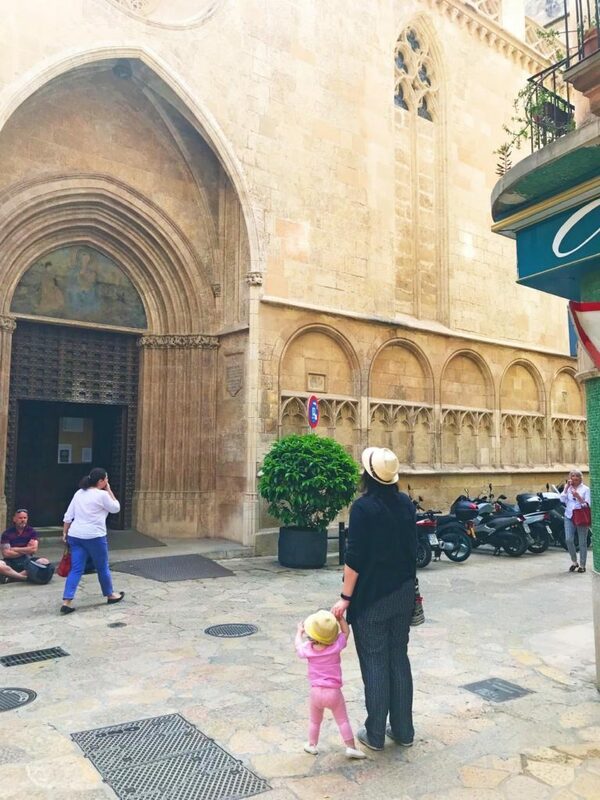 The little balconies that trail up the buildings, the colourful shutters with washing hanging from them, and the old men hanging out outside of little cafes are all an insight in to the real every day Palma and, for us, that beats the shopping, the aquarium (which is great for kids though) or the beach. 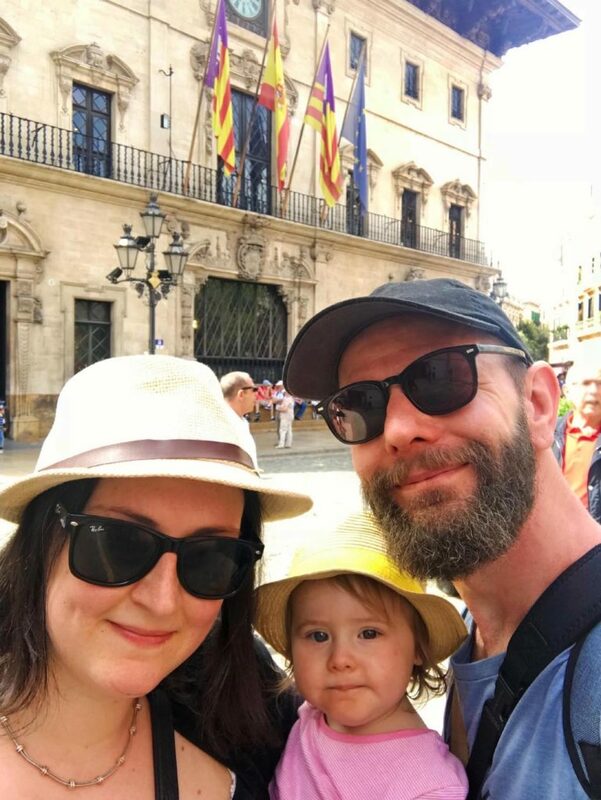 We could spend days wandering round the streets of Palma, eating in little tapas bars, grabbing a coffee at the counter of a local coffee shop, people watching and shopping. But Mallorca is a beautiful island of contrast and there is so much to fit it. Palma is not to be missed if you are visiting the island, but if you only have a few hours there, be sure to check out all the places above. Love love the look of that cathedral, you guys certainly made use of the short time you had in Palma, I am adding it to my list. This place looks so picturesque. The architecture is seriously stunning! What a beautiful cathedral. The fanciest cathedral I have ever seen. How absolutely stunning is this place? I think it’s amazing and definitely a must see! It’s really quite breathtaking, good to know you made the most our of your visit! That Cathedral is one of the largest most beautiful ones I have seen. I love the architecture, the little stone alleys and the balconies. I can’t imagine a building from the 1600’s looking that good. By the way she is the cutest! Oh my goodness, it looks like you really made the most of those three hours what some stunning build there are in Palma! That cathedral with all the detailing just beautiful. 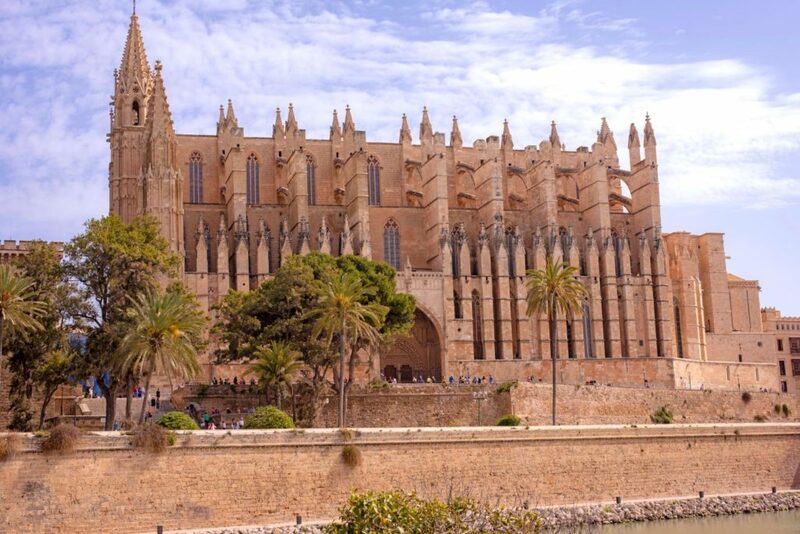 Palma Cathedral looks stunning and I bet it has an interesting history! It was lovely to read about Palma. 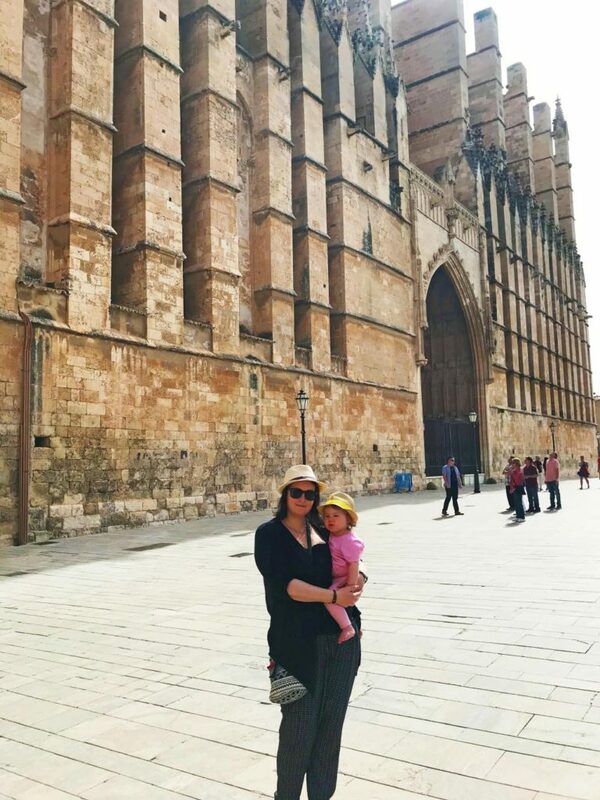 The Palma Cathedral reminds me of Norte Dame in Paris. such stunning architecture. I love the adorable streets and the cute purple bike. Looks like my type of place. Palma and Mallorca looks like a lot of fun. Your pics are amazing. The architecture is stunning. It looks like a great trip. I think it’s anazing that you guys take your daughter travelling so much. I wish I had of done that when my kids were young, but I think they are more than making up for it in their 20s. I have been to Mallorca a could of times, but to resorts. We have avoided going to Palma as we have little ones, but this is making me think it wouldn’t be too hard if it was just for a couple of hours. Awwh, Avery looks so cute in her little hat. Wow, Palma looks beautiful – I really must go now. You really have inspired me to add this to ‘the list’. 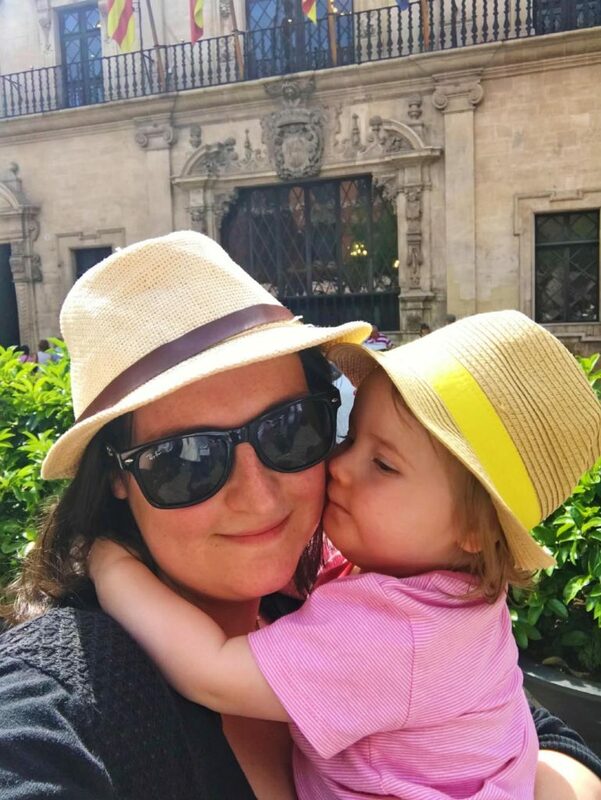 And your little girl is so cute – mine is 3 now but we did a lot of independent travel with her when she was that age and it is definitely a game changer, but so worth it. I truly love Spain never been to Palma de Mallorca though looks an amazing place to visit. The lifestyle in Spain is lovely like the tapas and relaxed environment. Very nice that you traveled as a family it is very nice to make memories together. That tree canopy street is breathtaking – I love cities with narrow streets lined by buildings too. Such a cool looking place! The buildings are so gorgeous especially the Cathedral! My mom and I were in Palma on a Meditteranean cruise about 10 years ago. We had no clue what was there, and did a cave tour through the cruise line which was so neat! Then they took us shopping before heading back to the boat. I wish I would have known about these other places as well! somewhere I have never been but want to go – thanks for the insight!